Shown are three plaster maquettes for three different sculptures or relief carvings (lower panel). Left to right, Indian and Bears, Indian and Wild Swans (with only one of four swans mounted on the wall), and Indian Rider. In the upper panel is a presentation model of Indian and Wild Swans, and a photo of the upper portion of Black Elk, a full-scale, larger than life, bronze in the Sculpture Garden. All are located at the Marshall M. Fredericks Museum of Sculpture at Saginaw Valley State University. Wonderful collage of our Native Americans! 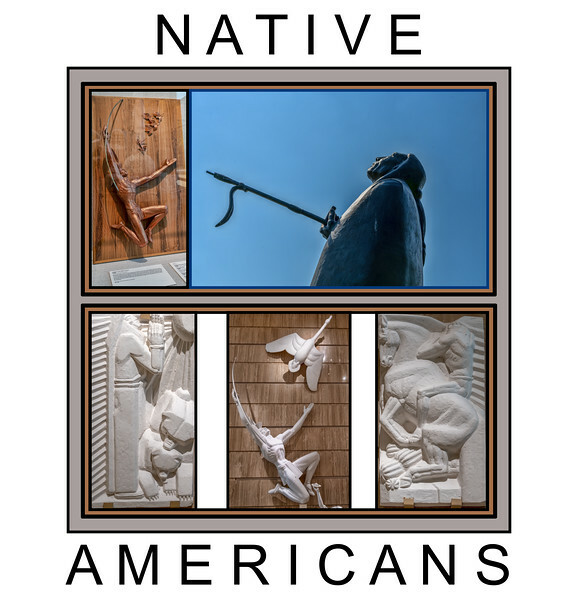 Now this is a wonderful collection of Native American items. I love them and it makes such an outstanding collage and grand N entry. Well done! Excellent collection of N shots.